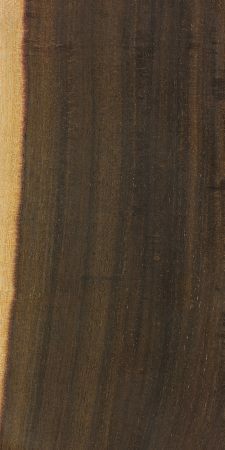 Color/Appearance: Heartwood is dark reddish or purplish brown, sometimes nearly black. The sharply demarcated sapwood is light yellow. Grain/Texture: Grain is straight, with a uniform, medium texture. Rot Resistance: Given its past use as fence posts, the wood is assumed to be very durable. Workability: Difficult to work with hand or machine tools due to its extremely high density. Reportedly turns and finishes well. Allergies/Toxicity: Besides the standard health risks associated with any type of wood dust, no further health reactions have been associated with Waddywood (though this may be due to the rarity of the tree itself). See the articles Wood Allergies and Toxicity and Wood Dust Safety for more information. Pricing/Availability: A rare (and protected) desert tree with no commercial presence. Sustainability: This wood species is not listed in the CITES Appendices or on the IUCN Red List of Threatened Species. However, it is a protected species listed as vulnerable under Australia’s Environment Protection and Biodiversity Conservation Act. Common Uses: Clubs, turned objects, carvings, and other small decorative purposes. Comments: The common name is said to be of aboriginal origin, where natives would make “waddies”—heavy wooden clubs—from the wood. When the tree is younger, its growth form resembles that of a conifer (such as a pine tree), and its species name, peuce, is derived from the Greek work for pine. After several decades of growth, mature trees finally begin to take on their adult form and branch out from the main trunk.